It's not often a rookie making his spring training debut warrants national news coverage. But then again, Tim Tebow's never been typical. The former NFL quarterback arrived at spring training for the New York Mets minor league team on Monday -- and, sure enough, the cameras were there. 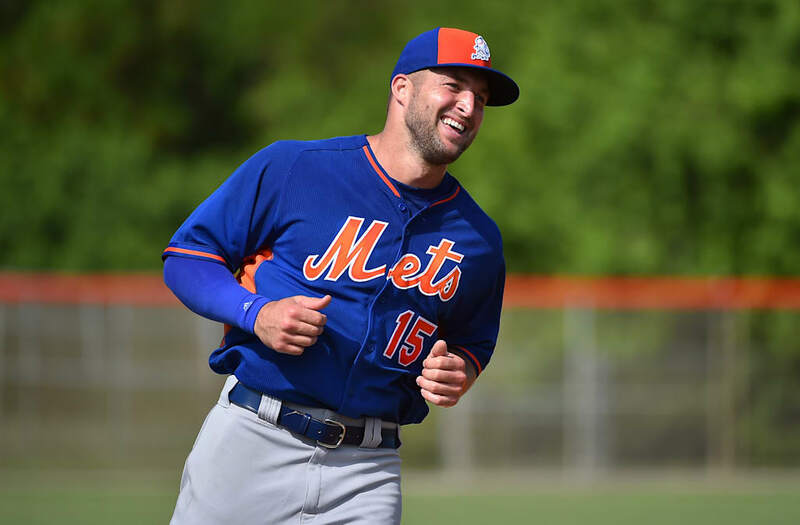 Tebow, an outspoken Christian advocate in addition to athlete, signed a minor league deal with the Mets on September 8. He focused on wowing the cameras with his hitting ability on day one, at knocking four home runs in the span of five pitches at one point during batting practice, according to CBS Sports. His move from football to baseball has drawn a fair amount of criticism, but Tebow says he doesn't pay attention to it. "I focus on what I can control. ... I'm not going to worry about what everybody's writing or saying," Tebow said. He also says his goal is to get better and improve as a baseball player every day, not necessarily to make the team. He's got plenty of room to improve. During his time in the Arizona Fall League Tebow had a .194 batting average with twelve hits and twenty strikeouts. When he's not on the field -- football or baseball -- Tebow focuses his efforts on his charities. Earlier this month his organization, the Tim Tebow Foundation, hosted a "Night to Shine" event. The prom-like event, hosted in many churches and designed to give special needs teens a special night, involved more than "75,000 honored guests through the support of 150,000 volunteers," according to his organization's website.